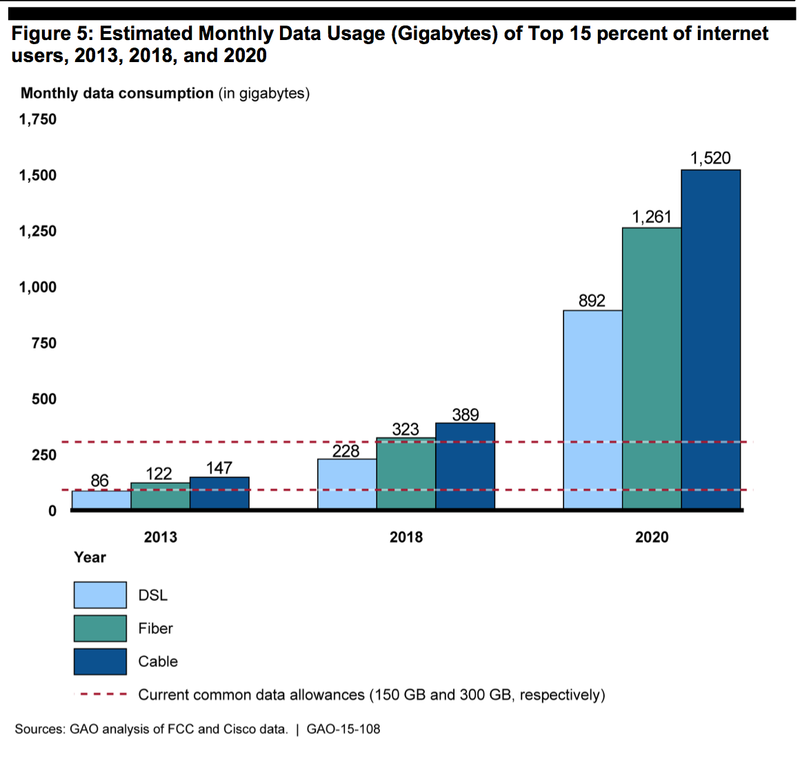 This chart from the GAO report shows that the top 15% of cable Internet users will be surpassing current data caps by 2018, and using several times that amount of data by 2020. A growing number of cable companies are implementing data caps (sorry — “data thresholds”), which put limits on how much data a subscriber could use before facing penalties ranging from warning messages to throttled speeds to overage fees. A new report from the federal Government Accountability Office says that lack of competition in the broadband market could result in these caps being implemented with no one benefiting other than cable companies’ bottom lines. The newly released GAO report [PDF] looked at both wireless broadband and fixed broadband and noted some important differences in the ways that the two different types of data delivery use data caps (or “Usage Based Pricing” [UBP]). The four major wireless all offer some form of UBP, charging overage fees or throttling speeds for users in capped plans who go beyond their monthly allotments, but only seven of the 13 fixed broadband providers looked at by the GAO currently use data caps. However, the wireless industry has acknowledged that data use is increasing, with providers generally increasing the gigabyte/dollar ratio so that many customers are getting more value than they did when caps were first introduced. The addition to the marketplace of tablets and other connected devices has also caused the introduction of plans that allow these devices to drink from the same monthly pool of data. Additionally, a number of wireless providers have offered data plans with lower usage thresholds that offer value to subscribers who want mobile broadband but don’t use it frequently. Meanwhile, the report states that many of the fixed broadband providers with data caps have not increased their monthly thresholds since 2012, even though more consumers are streaming more HD video to their home and adding new Internet-connected devices like gaming consoles, thermostats, and appliances. And while competition among wireless companies has resulted in low-threshold data plans that offer value to infrequent users, the GAO did not find comparable offerings from fixed broadband providers. Though the GAO doesn’t name Comcast specifically, it cites a fixed broadband provider who offers a mere $5 discount for a customer willing to limit themselves to only 5GB/month in data, which we’ve repeatedly pointed out is a meager reward for giving up 99% of the data allotment that other customers enjoy. The GAO says that data caps on fixed broadband “may not be warranted” and may be dependent on the relative lack of competition enjoyed by certain ISPs. “Most fixed providers said that their networks do not face widespread congestion,” the report explains about the “congestion” excuse given by many defenders of data caps. And while the cable companies claim that data caps currently only affect the 2-5% of users gobbling up the most data each month, the GAO acknowledges that there are many consumers on the precipice of crossing the threshold. Citing data from Sandvine, the GAO writes that cord-cutters who stream videos instead of viewing traditional pay-TV average around 212 GB a month. There is also data from the FCC showing that the top 15% of broadband users average more than 145 GB each month. “In addition, more users could be affected by UBP in the future to the extent that average users begin using more data-heavy applications and content providers continue to develop more data-intensive content and applications,” reads the report. While the FCC has recently begun collecting some data on usage caps, it does not yet track how broadband providers actually use these thresholds. The report also found, through talking with consumers in focus groups, that there is a lot of confusion among consumers about what sort of Internet activity actually uses the most amount of data. Others in the focus group initially labeled themselves “heavy data users” but it was later determined that most of their use was in low-data web browsing. In the end, GAO offers a pair of recommendations to the FCC. First, that it work with cable companies and other providers of fixed broadband to develop a voluntary code of conduct — similar to the one developed by the wireless industry — to improve consumer communication about data caps and usage. The other recommendation is for the FCC to begin tracking data caps on fixed broadband and their effects on consumers nationwide.